Jennifer has been following her interests in creating, designing, fixing, building and growing things since she was young. She received a Bachelor of Architecture from Cornell University, and later completed graduate work in Architecture and Planning at U.C. Berkeley. 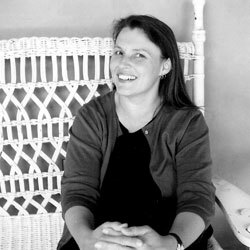 She has worked in architecture and related fields since 1987, at several firms in Delaware, New York, and San Francisco before founding her own firm in 2001. Jennifer has lots of experience renovating old buildings, having worked as a designer, carpenter, and construction manager – dealing with building details and materials, permitting processes, budgets, and hiring and overseeing contractors. Working for the Oakland Redevelopment Agency under Jerry Brown, Jennifer assisted with the revitalization of downtown Oakland and developed the City’s façade improvement program – which helped renovate hundreds of commercial buildings citywide. She has designed numerous residential and mixed-use projects, including her own home and studio (which she helped build with her husband, Architect Thomas Dolan), the PumpkinHouse, in Rockridge. Jennifer is a Certified Green Professional, and has made a personal and professional commitment to bring sustainable and green building practices to her architectural projects whenever possible. Her commitment to community revitalization led Jennifer to serve as Chair of FROG (Friends of the Rockridge-Temescal Greenbelt) and manage the completion of phase 2 of the well-loved and used neighborhood park. She currently co-chairs the Green School Committee at Park Day School, and is actively involved in developing its edible gardening program, as well as learning gardens – connecting the curriculum to outdoor classroom gardens. Jennifer is the mother of 2 wonderful children, who are some of her best teachers and advisors. She loves spending time outdoors with her family. An avid gardener, cook, and composter, Jennifer looks forward to her regular visits to the compost pile and picking lettuce from the garden for a supper salad. Whenever she gets a chance (not often these days), Jennifer also enjoys making and designing smaller creations: sewing, knitting, and printmaking. Sarah began working with Jennifer Cooper shortly after her graduation with a Bachelor of Arts in Architecture and Community Design from the University of San Francisco. During her last semester, Sarah directed her focus towards a Sustainable Development in Tianjin, China, where she worked directly with clients and the community in revitalizing housing in the small town of Shuankou. Sarah has refined her design skills and knowledge of architectural processes, and has extensive experience in CAD drafting and 3D modeling. She has worked on projects through phases of design ranging from the Schematic through Construction Documents. Sarah has worked on many different types of projects including multi-family and affordable housing, tenant improvements and live/work renovations, commercial core & shell improvements, commercial and residential legalizations, and single family residences. Sarah’s experience working in architecture has led her to fully enjoy the investigative process of architectural design and the challenges that her projects bring to the forefront.